The first couple of times through The Amazing Spider-Man 2's newly-released trailer, we spotted a number of clever Easter eggs and Marvel Comics references to entertain us, including hints that we could see Doctor Octopus and The Vulture and a suspiciously familiar outfit Gwen Stacy was wearing in one sequence. Luckily, we've got readers with even better eyes (or way more free time) than we have, and have received a number of messages pointing out stuff that we missed the first time through. This one's kind of funny: In our initial story playing the trailer for the first time, I first wrote and then removed a reference to a brief appearance by MJ. I'd been tipped by a reporter for another site, who had spotted her right away. I didn't see her when I watched it through, so I elected to delete the reference in case the other writer was wrong. She wasn't, though, and the image above appears to be MJ herself, wearing an outfit that actress Shailene Woodley was spotted wearing on set a few times. What's the big deal? 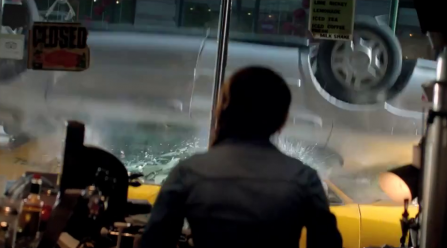 Well, aside from the fact that it's our first/only official "shot" of Mary Jane in the trailer, there's the fact that Woodley was reportedly removed from the movie. The idea at the time was that there wasn't sufficient breathing room to flesh out her story the way it deserved (which makes sense with all these villains) and that there was a possibility they wanted to give Gwen some more time as the uncontested love of Peter's life. Or could it be that they're gambling that Divergent might not be the hit everyone expects, and that there won't be any scheduling issues with Woodley. If she's actually in the film, what would it mean for Peter, and/or for Gwen? Could the theories about Gwen dying in this film take on more credibility if there's a girl in line to replace her? Certainly it can't hurt, since every Spider-Man movie so far has featured a much stronger and more integral love story subplot than literally any other superhero movie since Batman '89. Another hint that something bad might be in store for Gwen Stacy? Well, she's on Peter's crazy corkboard for some reason. Is she missing? Hurt? Has she been subjected to experimentation or surveillance by Oscorp? 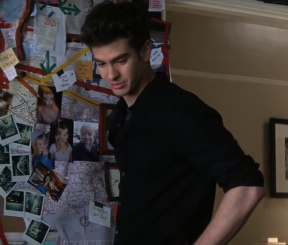 For whatever reason, you can see a handful of photos of Gwen in the shot behind Peter. 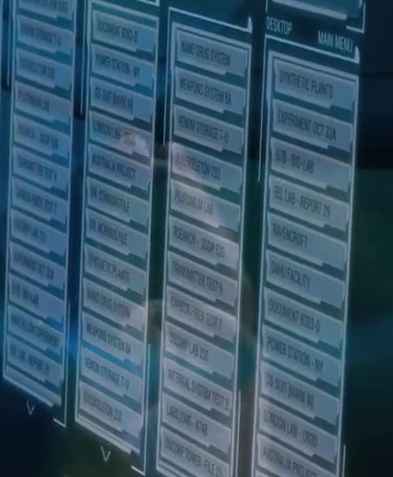 In the sequence where you see the Oscorp computer file tree, there are a handful of interesting things. Weapons, plutonium, nano drugs, synthetic plant, Ravencroft Institute...and at least two slots that I can see for "Venom Storage." Rumors of a Venom appearance have been rampant since the earliest days of production, when there were rumors that Spider-Man's black costume would show up, and the fact that Josh Trank was reportedly developing a film adaptation for the character before he moved along to Fantastic Four lent the idea some credence.